Welcome Back. I am joined today with Keith Cunningham. Penny: What are the factors and elements that you think have the greatest impact on productivity? Keith: Clarity on the outcome. Nothing is more important than having a goal line. To know when points go on the board. To measure the progress or milestones that are being achieved. Football is a great analogy. There are first downs, guard lines and much as people cheer for first downs, there are no points until they hit the goal line. Everybody knows where that goal line is. These are the jobs we need to do in order to produce that outcome. Owners typically make it far too easy on their employees. This is a shift in topic a bit. I happen to think that most people would like to have in a job is a high performance challenge. To me it’s unlikely that we’re going to get the Navy Seals to sit around and play Yahtzee all day. They are going to want a high performance challenge. We want those kind of individuals on our team. It’s impossible to keep and attract those individuals without those challenges. Some kind of outcome that will cause people to stretch. The keys to productivity are things like, a focus on outcomes, deliverables, high performance challenge, planning your day before it starts, as simple as an idea as that is. I think it’s one of the key drivers to productivity. Most people have a to do list. And the reason they are not productive, they are very active, but the reason they are not productive is because that to do list is not being converted into a project. A project gets calendar time. That is the only difference between a to do and a project. Planning your day, scheduling time every day to work on something that is productively going to move you towards the outcome that you want. Finally, I will say that the key to productivity, the mother of them all is accountability. In my world, accountability is fundamental to productivity. Accountability simply means that there is someone else that I am accountable to for not only my results but also for the activities of today that will produce those results. I will say it differently, anybody who doesn’t want to measure doesn’t want to be held accountable. To me, this idea of surrounding yourself with people who you will report into and who will tell you whether you are or are not moving towards the thing you said you wanted. Then having someone to coach you and correct you and call it tight. Say what needs to be said. I think it’s critical, the higher we go or the higher we want to go the greater the requirement to have someone around us to coach us and tell us the truth. Penny: I agree. There are so few people that will give us that unbiased truth. Michael Jordan, he has five coaches. Five people who are giving him insight because he realizes that there is not just one blind spot. There are a couple. Also people see things in different perspectives. He is going to get different perspectives with every person he talks to. He will get the truth, but everyone’s truth is a bit different. Make sure who you select as your truth tellers that they have the experience that you are looking for. Keith: All of us have blind spots and none of us have the ability to see what we can’t see. That is why we have people around us to give us coaching and optics to improve our game and produce the results we want. Penny: One of the things that I find to be the x factor for productivity is energy. I don’t believe all forms of times are equal. It’s also how much of ourselves we bring to that time. I know you have a newsletter about thinking time. Around this thinking and measuring time, can you expand that concept? Keith: Energy is paramount. Two people can go through the same motions, one improves and the other one maintains the status quo. I like to play golf. When i play golf, I go to the practice tee beforehand. I hit a few balls to warm up. I try to find my swing, adjust my grip. Figure out which part of me is hurting that day and adjust accordingly. So, I use practice time as a way to warm up. Tiger Woods on the other hand goes out to the practice tee and that is where he works. He plays the game of golf but works and improves on his practice tee time. When you watch a pro practice, what you will see it that the level of intensity that they bring to that practice, the level of energy and focus, that is what you are talking about, when you describe energy, its focus, commitment, the level of focus for Tiger is vastly different from what I bring to the practice tee. The energy that goes into it or the competitiveness that goes into it, I think is paramount. There is nothing more common than average. Average is usually produced by people practicing but they are not practicing to improve. When I look at Masters, at anything, like art, business, training and coaching, over and over again, what I see is a commitment to how can I improve. What can I do better? Am I bringing a level of intensity and focus to it that will cause that improvement? Measuring is a critical component. Most amateurs don’t measures. All pros measure. The reason they measure is because they are committed to getting better. Most amateurs are committed to getting the job done. Those are two entirely different ways to focus. If we begin to focus with your concept of energy, focus on how do I get better/improve/create mastery around this particular skillset or outcome, now all of a sudden, the level of energy is different. Another way to say it is, that most people get the results they got is the result of doing the best they can. Any time I talk to an employees or audiences, I ask, how did you get here? They all say, I did the best I could. My response is I know, that is the problem. The problem is we are all doing the best we can and the people who are at the top of the line, the front of the line, are people who gave up doing the best they can and began doing whatever it takes. That level of energy is an entirely different level of focus and commitment. I think your concept of energy is critically important because I think the outcome is vastly different if I go into a project or a process in which I am trying to get the job done vs. I am trying to create mastery. Penny: Yes, I give it another name. I call it Championship Psychology. Those people who do what it takes as opposed to the best that they can. They have a championship psychology. They bring that level of intensity and focus. I have four elements in my program that make up those: Purpose, Language, Physiology and Focus. That intensity they bring, that is what creates those types of results for them. When people are able to find the keys to get clarity on how they can achieve that for themselves, they are going to catapult their results as well in a mastery level. Keith: I love those four things. Thank you. Penny: We are coming to a close here on this session. Listeners, you have so many resources out there. I give your books to my coaching clients as a congratulations. Because of the power you bring into the measuring. If you could share a bit where people can find more information about your programs, book and you. Keith: Thank you. The best thing to do is to go to keystothevault.com and there you will find very extensive summary and compendium of not only the books but also the tools and the resources and the library you can begin to build around the business tools I teach. We hold business classes on things like the four day MBA or we have a course coming up called Plan or Get Slaughtered. We have a board of directors program. There are many ways somebody could study with me. Or to access the information and tools we have. I have another website called CFOscoreboard.com . It is a business tool that I have developed that allows business owners to translate the accounting mumbo jumbo that they get from their accountants in the form of financial statements. Translate that accounting stuff into business optics. In other words, we will translate accounting statements and balance sheets into optics that will allow you to make better decisions. My thesis is if we can see better, if we have better optics, we can make better decisions, and if you make better decisions, you will make more money. Most people wind up making bad decisions because they have bad optics. They can’t see what is going on underneath the hood. It’s a little bit like flying an airplane by the seat of your pants. Can you do it? Yeah, you could get lucky. The problem is you can’t get lucky forever. Eventually you are going to crash. You are going to run out of fuel. The impact of running out of fuel is devastating. Businesses report cards need to be translated into a score board. Warren Buffet said it well. If you can’t read the scoreboard you don’t know the score. If you don’t know score, you can’t tell the winners from the losers. I think the problem most business owners have when it comes to this issue of telling winners from losers, is they don’t have a scoreboard that they can understand. That is what CFO Scoreboard is designed to do. To give you better optics to make better decisions and make more money. Either one of those websites will give more information about who we are and what we do and what they can learn. Penny: Whether it’s a book or your program, they will learn. I love the fact that you are also offering something that is immediately implementable. This is powerful. That is really taking charge of your productivity. Keith thank you so much for being here. It’s been a pleasure and an honor. I took many notes. It was fantastic to have you here. Keith: Thank you very much Penny. Penny: In summary, if you are serious about your business then you need to get serious about the art of measurement. I call it an art because it requires the business owner to be able to grasp the fine details and trends and more abstract elements that contribute to the key drivers. You need to understand and implement the data that is derived from key performance indicators that tell you about the trends after the fact. And the key drivers that contribute and shape those results. By monitoring these on a regular basis you can assess the health and wellness of your company and address the issues that might impact the bottom line long before they are at crisis point. You want to use these drivers to set thresholds and anticipate the challenges so you can take corrective action before the final results are available. This gives you a health check at any point in time and in any condition. We talked earlier about the types of professionals who know exactly what they are measuring. Chances are you would be upset with them if they didn’t. Imagine doctors going into surgery and they operated on the wrong limb or gave you the wrong medicine. Can you imagine if he knew something was wrong but didn’t bother reviewing your chart? I know it sounds extreme but this what you are doing with your business if you are not measuring. Do you know exactly what you need to measure and test? Or do you waste time and resources on the wrong measures that add no true value to the process. An example of how that can happen: I often find within insurance sales teams that they are still focused on the old fashioned method of measuring the amount of calls the agents do and consider that their key measurement. No wonder there is such a large dropout rate. They are still being taught to focus on the wrong things. Instead of focusing on using strategy to target customers to make the right calls to the right people and tracking those numbers, they are tracking the number of random calls and counting on an ineffective spray and pray approach. Very tactical and not as effective. Measurement is meant to be a part of the overall strategy and a way to ensure that progress and growth is made. If you have poor strategy, chances are you are measuring the wrong things. So before you define your dashboards and your means of measurement, make sure your strategies are specifically targeted. If you like what you heard here today, please send us a message on Facebook or Twitter. www.facebook.com/pennyzperspective. www.twitter.com/pennyzenker. Join us next week as we talk about another one of the ten essential elements in time and energy management. Learn the key language that you need to know to understand how to get results out of productivity. 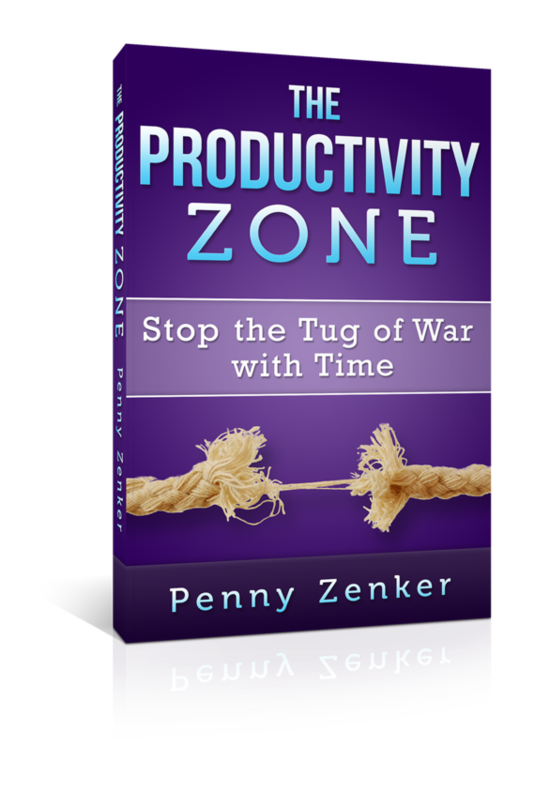 Until next week, this is Penny Zenker reminding you to take charge of your time and energy. It’s a choice you can feel good about.